The updated iPads expected to debut tomorrow will feature Touch ID sensors and improved cameras able to shoot in burst mode, according to an apparent slip-up posted by Apple to the iBooks store. 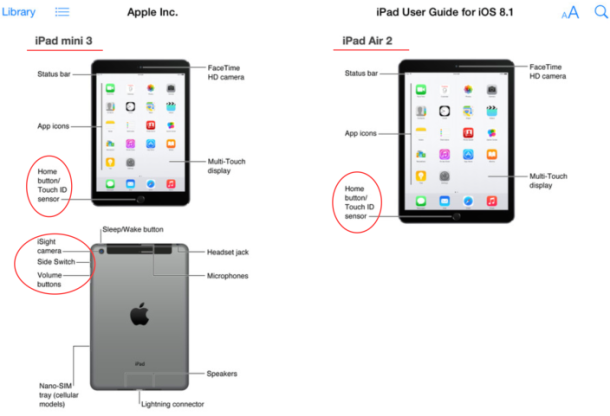 The iBook featuring the iPad information appeared briefly as a user guide for iOS 8.1, which has since been pulled, and made direct references to “iPad Air 2” and “iPad Mini 3”. The leak was first discovered by 9to5mac and has since been pulled down by Apple. 9to5mac says the user guide would seem to suggest iOS 8.1 will also debut tomorrow as an update alongside the new tablets. The iPad Air 2 and iPad Mini 3 appear to feature the same aluminum style enclosures as existing models, suggesting the updates are mostly internal changes. The new iPads are expected to officially launch tomorrow at the October 16 event, which has been rumored to feature the debut of a revamped iMac line complete with a Retina display, and the final public release of OS X Yosemite. What a bore. iBore Air and iBore Mini. Show me the Retina iMac, that’s what I want to see! Where did you see the iBore? Did they announce this yet? Apple will be releasing a new product tomorrow – the iBorg – so we can all be assimilated. (Joke). But seriously, an iMac refresh with retina displays, or 4k displays, would be nice. Just don’t solder the memory to the motherboard – let the consumer have some control over upgradability. Same with MacBooks. Sometimes you really need just to upgrade RAM and HDD, not the whole device… WTF! I can’t imagine why anyone would get anything from apple. My iPad has been junk since the iOS update !